The Window Of Opportunity! Are You Taking Your Post-Workout Protein In Time? Ever heard of the 'Window of Opportunity' theory in relation to bodybuilding? Chad Shaw breaks it down for you and examines the truths behind the theory. Throughout the 25 years I've been bodybuilding there is one theory regarding muscle growth that has struck fear into the hearts of bodybuilders and anyone else who goes to the gym and puts forth lots of gut wrenching effort pumping iron in order to build muscle. 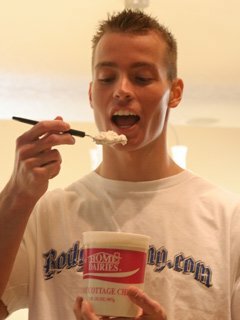 This long standing theory that has been printed in countless bodybuilding publications suggests that the moment your workout ends there is a critical, 45 minute "window of opportunity" that opens up leaving you exactly 45 minutes to consume a hefty dose of protein to replenish the body with essential amino acids in order to produce any muscle growth from your brutal workout. Struck Fear Into The Hearts Of Bodybuilders. From the first time I heard of this theory I was little suspicious. Just the whole notion that the second you complete the last repetition of your workout, your body instantly begins a 45 minute count-down that you have to consume lots of protein before the porthole to muscle growth slams shut after those 45 minutes elapse. Sort of like how Cinderella had to be home by the exact second the clock stuck midnight, or else her coach would turn into a pumpkin, and she would turn back into a wench. You see, two very similar fairytales! The Window Of Opportunity Theory Suggests That You Have 45 Minutes After A Workout To Consume Enough Protein To Produce Muscle Gains. Looking back it makes laugh when I think about some of the ridiculous antics guys at the gym pull so that they wouldn't be denied muscle growth in that 45 minute window of opportunity. Some guys would finish their workouts and go flying out of the gym parking lot like Flash Gordon, hop in their cars, take off, and drive frantically, running red lights, maybe running a few people off the road, just to get home to eat. Then I would see other guys sprint to locker room at the end of a workout and pull a can of tuna fish out of their gym bag, pop it open and start inhaling tuna like a Tiger Shark! That always made for a pleasant smell in the locker room! As for myself, I didn't pay much attention to this theory because it didn't make sense to me. There were some times I would get home and eat right after a workout, but then other times I would have a few things to go do before I could get home and sometimes 2 hours or more would elapse before I had a chance to eat. Either way, it never seemed to make much of a difference in my strength and muscle gains. Finally I read a publication regarding this post workout window of opportunity from a respectable source that made a lot of sense to me. The author of this article was none other than Jeff Everson. For those who aren't familiar with Jeff he was former National Collegiate Olympic- Lifting Champion, winner of 5 USA National Body building titles, and also the one who trained the famous Cory Everson to help her earn 6 Ms. Olympia titles. In other words, Jeff knows a thing or two about building muscle! In a nut-shell, what Jeff explained in this article is that the meal you consume before training is more important than the meal you consume after training. Besides usable carb energy, as in other sports, he argued that the so called post training metabolic "window of opportunity" was taken out of context since proteins entering the mouth are not instantized to potential nutrients at the level of liver deanimation and transanimation , or into the flux of muscle fiber cellular metabolism. In other words, the nutrients you consume a couple hours before your workout are actually the ones that are falling into this "window of opportunity" during and after training. It takes significant time in order for protein and complex carbohydrates to go through the whole digestive process that is necessary to replenish usable amino acids and glycogen to your muscles. This isn't to say that taking branched chain amino acids and or creatine before and after workouts is a bad idea. These particular amino acids undergo a much more simple route of absorption so they can effectively be utilized by your muscles within minutes versus the hours it would take to digest a whole food meal. Recovery and muscle growth is a 24-7 deal! The body will slowly break down proteins you consume into the essential amino acids that it needs to facilitate growth and repair, little by little, over a long duration of time. There is no such thing as instant muscle recovery or instant muscle growth no matter how many nutrients you take in before or after a workout. There are supplements like branched chain amino acids and creatine that I believe may help speed the process along, but all in all, building muscle naturally takes time and you need be patient. So now you can save yourself lots of stress! All is not lost if your unable to consume a meal within 45 minutes upon the completion of your workout. Even missing a meal here or there will not hinder your efforts to gain muscle. The body is very resourceful, so should you miss an occasional meal, your body will simply make up for it by absorbing and utilizing more of the nutrients the next time you eat. As I mentioned before, muscle recovery and growth is full-time operation your body is running 24 hours a day and 7 days per week. My goal is to take every opportunity to get my knowledge out there for people to use in order for them to best meet their goals.